Sea, Sand & Sky: Look what we found! My first week at Community Boating, I was not so hyped to be there. When I arrived, the site looked boring. It looked like school on water until I actually stepped on the docks. Me and some co-workers took a ride on a boat with our SME Paul and went to go get an eel trap they had put down the previous day. Everything was fun some little kids I met taught me how to set up a sail which was a blast. I felt like the student for once. We had caught 6 eels. 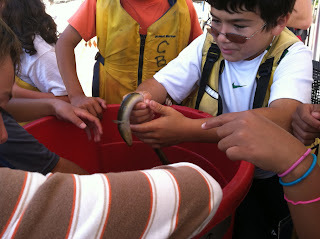 I was scared to pick up the eels but I did pet them. The best part was watching the kids having so much fun putting the eels back in the water and looking forward to the next day. The site opened my eyes to a new type of species. I learned so much. I learned how eels only have one long fin. My experience was very fun and interesting and I cant wait until I go back and go kayak with the whole crew.